The Denver Post recently did a five part series, “Drilling Through Danger,” about the dangers oil and gas workers face in Colorado, a more in-depth account of Colorado’s oil and gas industry than previous pieces they have done, and which I wrote about last July. First off, The Denver Post notes that in a 12 year span, an oil and gas worker died once every three months on average in the state. When you see a number like that, it makes you wonder, are we in Colorado more concerned with the industry or the workers? The piece goes on to state that the Occupational Safety and Health Administration (OSHA) rarely heavily fines oil and gas companies for poor working conditions that lead to injury and death. In fact, according to The Denver Post, only once in the past 15 years has an oil and gas company paid a fine of more than $50,000 for a workplace safety inspection in Colorado. In basically that same time period, these companies have negotiated away more than $1 million in fines for safety violations, according to The Post analysis. The Post also searched through OSHA reports, state records, and court filings, and found documentation for 38 deaths related to oil and gas extraction in this 15 year time span. And in two of those deaths, OSHA never investigated, even after the deceased’s families filed lawsuits accusing the companies involved of responsibility for the deaths. So what is OSHA doing? Well OSHA is supposed to be able to enter a workplace to inspect and investigate a situation when needed, and able under federal law to “enter without delay.” However, according to The Post, OSHA has had to go to court multiple times since 2000 to get warrants to inspect oil and gas sites. Which begs the question, what is stopping OSHA? Inspections of oil and gas fields are extremely important given the inherent dangerousness of the industries. OSHA’s process and investigation has led to them fining oil and gas companies in Colorado for about $3.42 million total since 2000 for workplace safety breaches. However, they ultimately settled for $1.94 million. The Post’s analysis of OSHA’s data between 2000 and 2015, found that about $40.6 million of fines levied against all companies in Colorado, ended up being reduced to $25.5 million after settlement. A 37 percent drop. But for the oil and gas industry in Colorado, during that time period, total fines were reduced by 43 percent! So what more can be done? The article mentions regional safety councils in Colorado that hold meetings to discuss emerging dangers in the oil and gas industry and there are safety requirements written into contracts, job safety analyses conducted and daily safety meetings. But is this enough? Then you add in workers’ compensation claims. According to the article, a very worrisome statement that came out of a 2013 workers’ compensation claim, in which the claim was ultimately denied, had a worker stating he didn’t report a work-related injury right away “because he did not want his co-workers to lose their safety bonus.” And apparently in a 2011 claim, a worker said that company representatives insisted on going with him to doctors’ appointments regarding his injury. These actions are not ok. Sustaining a work-related injury and recuperating from it is hard enough. Knowing that workers fear retaliation, or that company representatives want to be present while you’re with you doctors is just unacceptable. The Mine Safety and Health Administration, created by Congress in the 1970s, provides specific protection for miners, however, nothing “comparable” really exists for the oil and gas industry. In 1983 OSHA wrote a notice stating, “OSHA believes this lack of adequate regulatory protection has contributed to the high number of deaths and injuries in [the oil and gas] industry.” The oil and gas industry then pushed back, and the result: the oil and gas industry is now exempt from many of the types of specific workplace safety standards that other industries must follow. Added to the problem is that often OSHA can only tell an oil and gas company that it has to fix a problem. It, however, cannot order the company specifically how to fix that problem, which seems to say that this industry will continue to do as it does without having the proper oversight. In the end it makes no sense that the mining industry would have higher safety standards than oil and gas, especially, nowadays when so much of our energy comes from these two fuels. The Denver Post goes on to discuss how many of the oil and gas companies “farm out” their management to subcontractors. This in turn can dilute safety standards and ends up protecting the companies from liability. The quality of safety programs and protocols for workers just seem to deteriorate. Then there is the added issue that contracts between company owners and subcontractors often contain a provision in which the company and subcontractor agree not to sue each other over workplace incidents regardless of who is at fault. 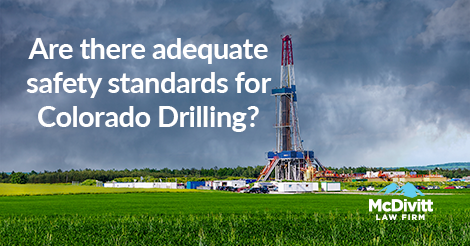 This contractual provision is so controversial many high producing oil and gas states have banned it—but not Colorado. Additionally, in Colorado, the workers’ compensation system which is there to help employees, has no other form of recourse, such as punitive damages, against companies with lax safety programs that injure or kill their employees. Workers are limited to recovering only what workers’ comp says is needed to treat their injuries. While workers’ comp is an extremely important system, surely it is disheartening to know there is no other measure for workers to hold companies accountable for not providing safe work environments when they are injured. Included in these contracts between the companies and subcontractors are often clauses known as “indemnification” clause. They often hold site owners harmless in the event a worker for a subcontractor is hurt on the job, even at the owner’s fault. According to The Post, these clauses are so controversial in the oil and gas industry that four of the country’s highest-producing states — Texas, Louisiana, Wyoming and New Mexico — have enacted laws that ban or limit indemnification in oil field contracts. So are there any solutions to the problems facing oil and gas workers in Colorado? Unfortunately in Colorado there is no commission or council devoted solely to worker safety, or an agency that warns lawmakers about trends in worker deaths. It may be time to start to think about this. Added to the fact, Colorado is one of only nine states not participating in a federal survey that tracks when workers are hurt but not killed, according to The Post, creating a lack of knowledge on our part. a legal change that might encourage companies to investigate more deeply after an accident. All are great suggestions in The Denver Post article, but if you have more let your local legislature know, that’s how we make change. For more on this series, you can also check out The Post’s piece on new technology in the oil and gas industry. Is Corporate America Failing its Injured Workers?